The buzz of power tools reverberated off fresh planks beneath Nan Unley’s Tuckerton home. 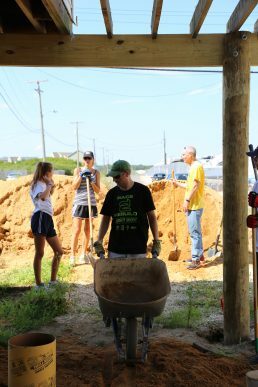 Voices shouted directions over clinking nails and grinding drills as volunteers from A Future With Hope and Race2Rebuild worked together through the sweltering heat of Saturday, August 13. “Four years later and we’re still here,” Unley said, wiping sweat from her brow and resting against a new piling holding up her house. In 2012, Superstorm Sandy left Tuckerton devastated, and the work continues. “My boss took a ride here two weeks ago and said, ‘Nan, I can’t believe it. So many homes still not fixed!’” Unley said. But now that has changed, at least for Unley, who in February garnered support from A Future With Hope. 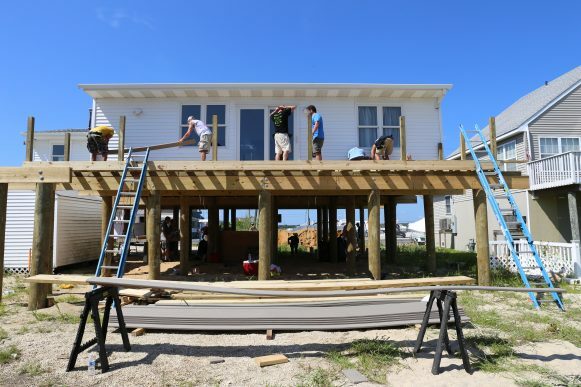 As the mission arm of GNJ, the organization remains one of the last standing in the field throughout New Jersey helping rebuild and restore neglected homes and lives still reeling in Sandy’s wake. 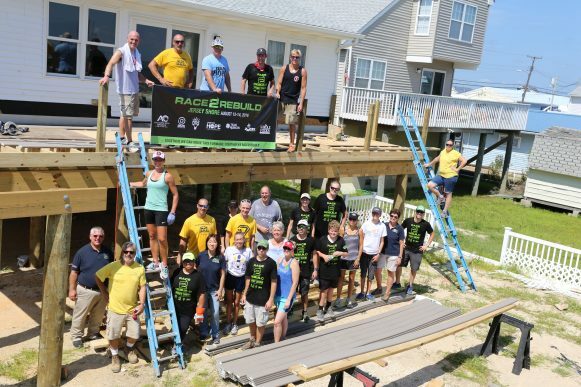 This summer, the organization partnered with Race2Rebuild, a nonprofit endurance sports program supporting disaster recovery by participation in rebuilding projects. Also founded in Sandy’s aftermath, Race2Rebuild’s national team of volunteer athletes partner with various racing events to raise funds and build awareness for families and individuals with lost or damaged homes. 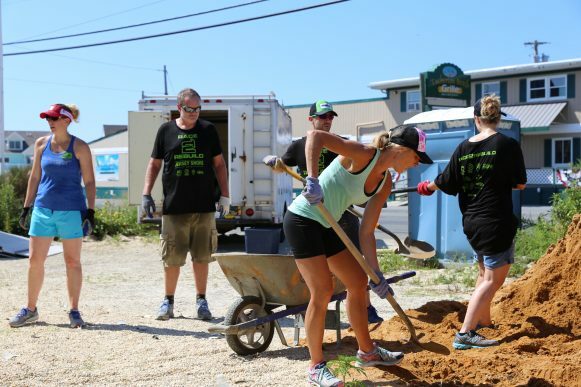 This year, DelMoSports, Atlantic City Sports Commission and Race2Rebuild partnered for a Jersey Shore Hurricane Sandy rebuilding project with A Future With Hope and the St. Bernard Project (SBP) before the Atlantic City Triathlon and 5k on August 14. Volunteers of all skill levels assisted multiple projects in Monmouth and Ocean Counties to continue the recovery efforts from Hurricane Sandy often ignored in the media. Unley had felt forgotten for several years, having lived in eight different places including an RV and on family member’s couches. “My daughter is living with friends in Burlington County, and her daughter is living with me at my mom’s in Tuckerton so she can continue attending Pineland’s school district which is familiar with her special learning needs,” Unley said. In 2002, Unley bought her home in Tuckerton and moved from Cinnaminson out of a love for the Jersey Shore. Friends and family told her she would never be able to afford the venture but with perseverance and determination she worked hard to make it happen. Later that year, she lost her son to a seizure. His two young daughters “lived for coming to Nannies to crab and fish.” Unley’s son asked his mother never to move because of how much he and the family loved the Tuckerton home. Unley has held on to those words. “So every time I was feeling like I hit rock bottom, I would remember what he said, and fight on,” she stated. In 2014, Unley was laid off from a nursing job at a pediatric medical daycare in Atlantic City but was fortunate enough to quickly find work at another medical daycare. She described the panicked experience of job hunting without a place to call home as stress-filled and taxing. Since 2012, A Future With Hope has rebuilt 242 homes with the help of 11,401 volunteers from 44 states, DC and Canada. Using skilled volunteer labor and professional tradesmen, the organization has offered homeowners construction solutions that help stretch dollars further. It’s estimated that approximately 5,000 families’ homes are still in need of repair from damage caused by Sandy. 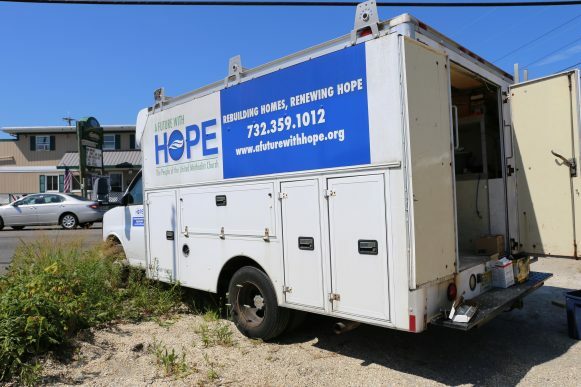 Today, A Future With Hope has active rebuilding projects underway in Atlantic City, Beach Haven, Brigantine, Highlands, Keansburg, Lanoka Harbor, Little Egg Harbor, Long Branch, Longport, Neptune, Ocean City, Toms River, Union Beach, and Unley’s home in Tuckerton. A Future With Hope has received grants from UMCOR, Robin Hood Foundation, the American Red Cross, Hurricane Sandy Relief Fund, and the people of the United Methodist Church.